​Arguably the greatest player of his generation, Ronaldinho turns 39 today, giving us an opportunity to celebrate one of the most entertaining highlight reels in football history. While he perhaps didn't enjoy the career longevity that his sublime talent suggests he should have, he is remembered by a generation of football fans as one of the greatest ever - largely thanks to his unparalleled ability to ruin defenders' lives. In celebration of his birthday, then, here are seven of the most memorable moments from his outstanding career. With the score tied at 1-1 as the second half of the quarter-final tie between Brazil and England got underway, a 23-year-old Ronaldinho floated a seemingly innocuous ball goal-wards from near enough the halfway line, but his intentions became clear as it approached David Seaman and flew over his head into the back of the net. It would be the decisive goal. Though there is much (irrelevant) debate to this day over whether or not he meant it, it was perhaps the most famous goal of many scored on Brazil's way to lifting the trophy in 2002, and marked his arrival on the scene as a major talent. Ronaldinho, Ronaldo, and Rivaldo would score 15 goals between them over the course of the tournament - there's a 'golden generation' for you. After his World Cup heroics put him on the map, he was tipped to move from PSG to one of a number of Europe's major powerhouses at the time, and in one of the most famous transfer faux-pas' of the decade, ​Real Madrid chairman Florentino Perez reportedly passed on signing him because he was 'too ugly.' Mean. After Real thought better of it, he would instead sign for ​Barcelona that summer, and 18 months later would deliver a devastating performance against his would be employers at the Bernabeu, putting the Catalan side well on their way to the 2005/06 ​La Liga trophy. Barça ran out 3-0 winners, with Ronnie running riot in the second half, tormenting defenders left, right, and centre, adding to Samuel Eto'o's opener with a double of his own. ​Of course, by the time he single-handedly took Real to pieces, he was already well established as one of the world's best players. That was, largely, thanks to a 2004/05 season that saw him fire Barcelona to the first of his two La Liga trophies. Granted, that was back in the day when an attacker didn't have to score 50 goals in a season to be considered the best player in the world, but still, it was some feat. In a quite frankly offensive show of skill, the guy went and did this in a Nike ad campaign back in 2006. After being presented with a pair of new boots, he decides to do a few keepy-uppies, taking the ball with him to the edge of the box. He then turns and casually volleys it off the crossbar, only for it to return to his chest like a boomerang and allow him to resume showing off. As if doing that once wasn't superhuman enough, without the ball even touching the ground, he proceeds to do it another three times, before getting bored after about two minutes and walking away. Scientifically, physically, gravitationally, it should not have been possible. Cristiano Ronaldo might score 50 goals a season, but Ronaldinho is the better player until he can do this. I don't make the rules. Disclaimer: the video might be fake... but let's just believe it's not. 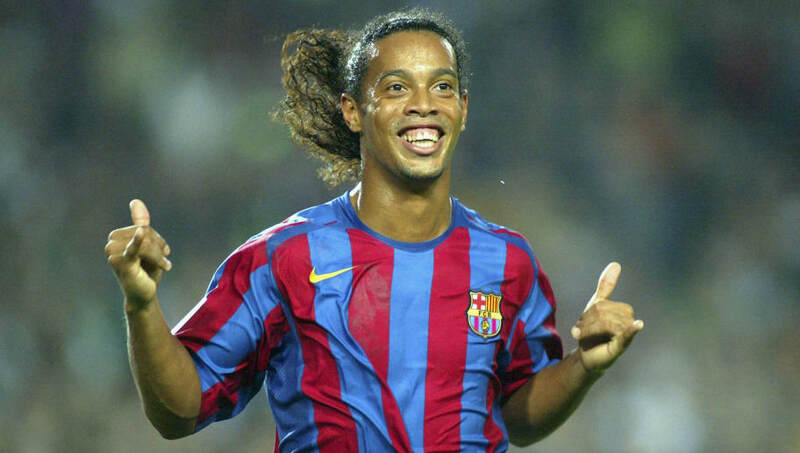 At the height of his powers in the mid-2000s, there were few who could get near Ronaldinho, as he won virtually everything there was to win during a hugely successful spell with Barcelona. Among those honours were the 2006 Champions League, and while it was Henrik Larsson who proved to be the hero on the day - coming on after an hour to register two assists and turn ​Arsenal's lead on its head - the tournament was strewn with scintillating performances from Porto Alegre's favourite son, as he danced Barcelona to eventual victory. ​The 2006/07 season was a forgettable one for Barcelona as a whole. Beside retaining the Spanish Super Cup for a second successive year, they didn't lift a major trophy, allowing their grip over La Liga to slip as Real claimed victory on their superior head-to-head record. For Ronaldinho, however, it was one of his best individual seasons. He finished as the league's top scorer with 21 goals, which included this preposterous overhead kick against Villarreal. I'm still not entirely sure how he did it. He takes it down on his chest, it sort of bounces over his head, forcing him to quickly turn away from goal, but almost in the same movement, he throws his inside foot at it and lobs the keeper with an overhead effort. Madness.